URBED are working with Carbon Coop and GMCVO to provide training and support to community groups interested in developing their own community scale energy saving and energy generation projects. This is part of a wider collaoration with Carbon Coop, MERCi and GMCVO Community Hubs team to deliver an 18 month programme of capacity building, project development, technical and enterprise support for community renewable and retrofit projects in Greater Manchester. This includes four community renewable energy ‘Trailblazer’ projects in rural areas, aiming to inspire other groups, and providing initial start-up support to new community energy enterprises. The workshops have been planned to be lively and interactive, with plenty of time for discussion, knowledge sharing and examination of case studies. 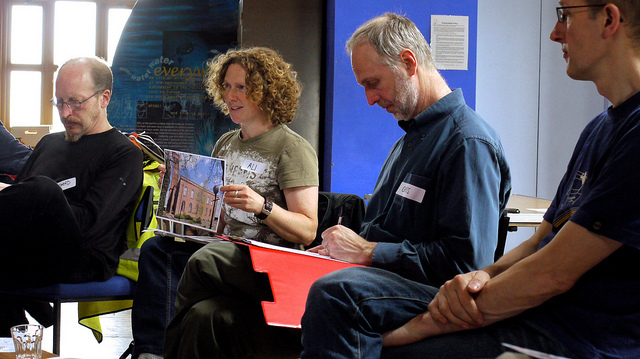 “Great chance to learn more about building retrofit and meet others working in the same area."